One by one, I have been introducing you to a group of Rio Mayo carvers whose masks I first encountered in 1988 or thereabouts. 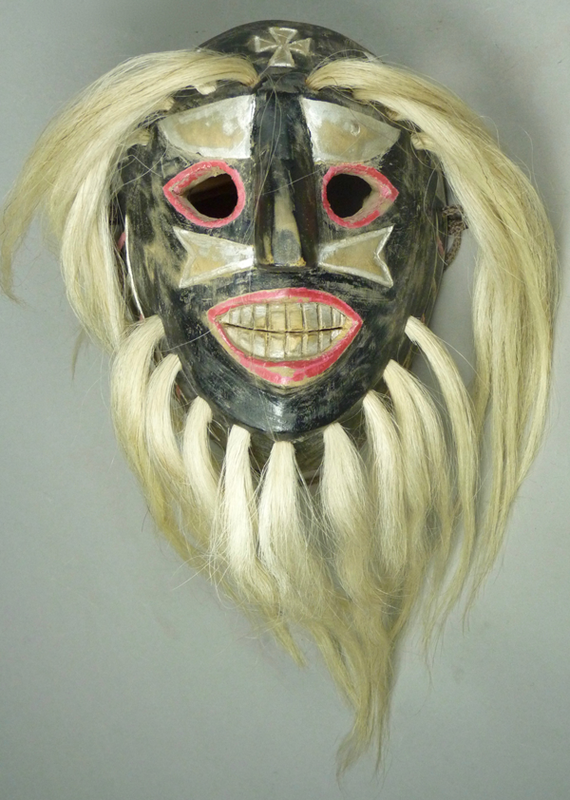 As has been my common experience, the masks of this carver came to me as the works of an anonymous artist. Over the passage of 30 years, I have usually been able to put a name to most of my mystery masks, but here is a trio whose maker has long eluded me. Recently my friend Tom Kolaz told me that he believes he has figured out this mystery, and I will leave it to him to tell us more when he eventually publishes on his Mayo research. For now I will name this artist by one of his border designs—the Floral Borders Carver. Apart from this feature his masks are absolutely generic, with typical Rio Mayo features. I bought my first mask by this carver from Robin and Barbara Cleaver in 1988. They had obtained it from Roberto Ruiz, a man who often brought up masks from Sonora for various Indian arts dealers and collectors in Arizona and New Mexico. Arriving as usual with little provenance, this mask seemed very primitive to my eyes at that time, although now it seems so typical of the Rio Mayo area. This one does not have the intertwined floral border, but the next two masks share that feature. In fact, this first mask has a very simple rim design, and there are red splotches of paint on the cheeks instead of more formal wedge designs. Today we will examine the masks of another interesting Mayo master carver, Brígido Valenzuela of Guayparín, Sonora. 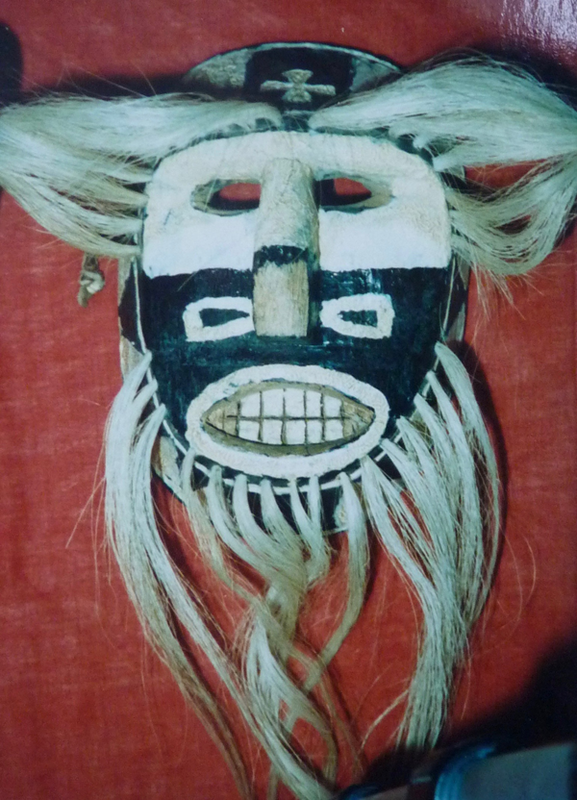 In Jim Griffith’s Masters Thesis of 1967 he showed a photograph taken in 1965 of a Pascola mask by Brígado Valenzuela (809-34, figure 15); “This was his first attempt at mask making,” said Griffith, but he didn’t indicate its age. 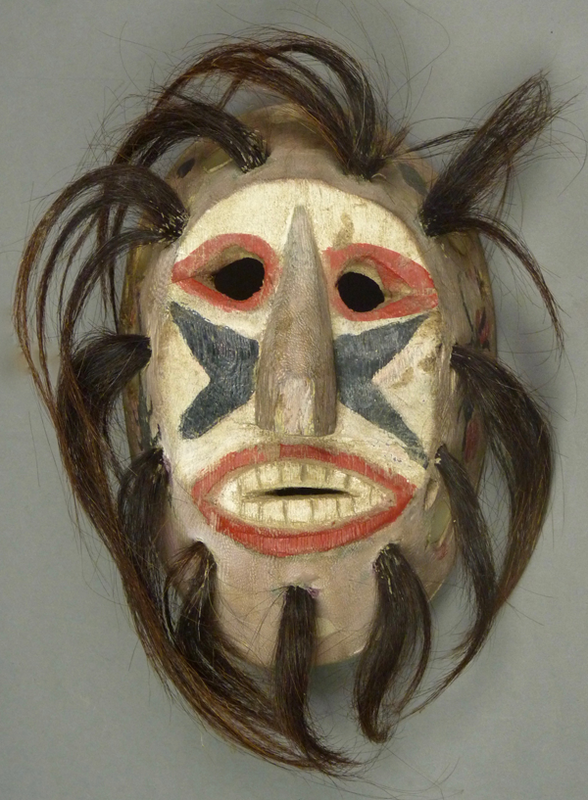 Here is a link to a photo of that mask on the Arizona State Museum Website. In June, 1988 I purchased an anonymous Pascola Mask from Robin and Barbara Cleaver. When I compared it to another in a friend’s collection, I learned the name of the carver—Brígido Valenzuela. I liked this mask a lot, but I gave it up in a trade for another important mask. Here is an old (and harshly lit) flash photo of that mask. Last week we looked at masks that were probably carved by Plácido Alamea, rather than by his son Marcelo Alamea. 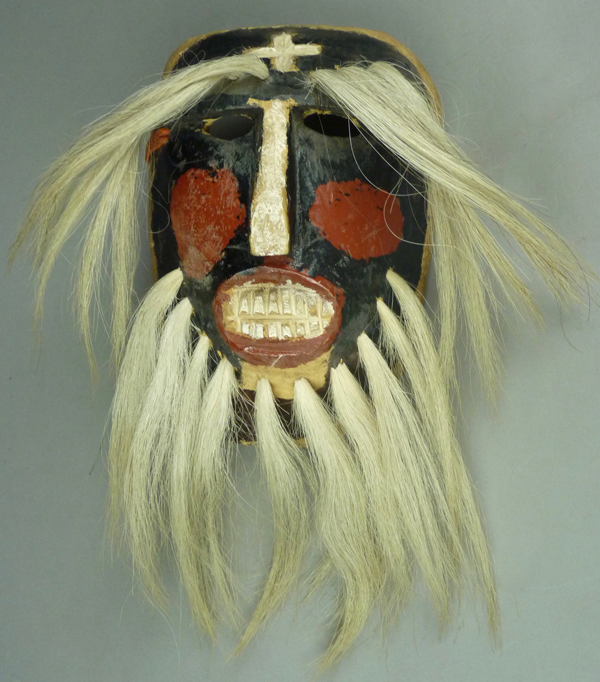 This week I will show masks that were identified at the time of collection as the work of his son. It is possible that some of these were carved by Plácido. I bought the first of today’s masks on EBay™ in 2010 as an anonymous mask. Comparing it with masks by Plácido and Marcelo in other collections, it seemed much more likely to be by the latter. My general impression is that the noses on Marcelo’s masks imitate those of his father, but they are often less delicately carved. In his Masters Thesis of 1967 on Rio Mayo masks and carvers, James Griffith wrote about Plácido and Marcelo Alamea (pp. 105-107). Marcelo was Plácido’s son and both are deceased. In the Spring of 1965, when Griffith was working in the Rio Mayo region, Plácido was about 60 years old, and living in Jitombrumui, Sonora. He had danced as a Pascola, foot pain led him to retire, but he continued to play the violin at fiestas. “He also makes violins, harps, and masks, and has some reputation as a curandero,” wrote Griffith. Marcelo , who was living in Loma del Refugio, Sonora, was also a mask carver and a festival violinist. Griffith felt that father and son carved similar masks, as if there might be an Alamea family style. He described their masks as having “complex borders” and observed that ” six of the masks have horizontally flat faces with vertically convex cheeks.” When present those cheeks do provide one marker for masks carved by the Alameas, although some of their masks lack this feature. 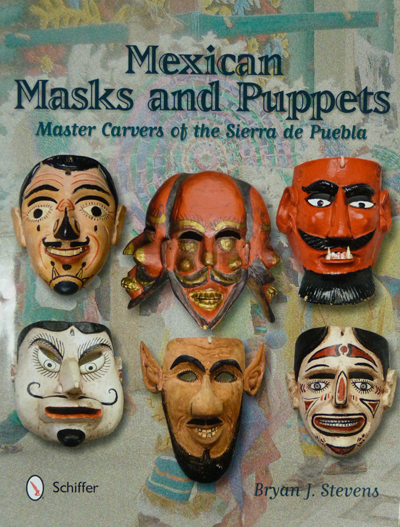 Mexican Masks, by Donald Cordry, was published in 1980. In that book we find a photo of “Don Plácido” that was taken by Cordry in Antanguisa, Sonora in 1938 (plate 140, page 101); Placído was carving a mask and a completed mask was nearby. According to Leonardo Valdez, who had assembled a Museo (museum) collection of Mayo dance material in Etchojoa, Sonora, this Don Plácido was Plácido Alamea. Leonardo had one of Plácido’s harps on display in the Museo. Unfortunately I have been unable to locate Antanguisa. Griffith shows Jitombrumui on a map that indicates it lay 10 Km. to the west of Navojoa (and 10 km. west of Loma del Refugio, Marcelo’s village). I visited Jim Griffith at his home near Tucson in 1990, and he kindly allowed me to photograph the masks he had collected during his research among the Mayo Indians of Sonora. At the time I wanted these photos as visual records of carver’s styles (a reference library), and I never sought his permission to publish those images. Since then Jim has donated those masks to the Arizona State Museum in Tucson, Arizona. At about the same time I obtained the book written by James Griffith and Felipe S. Molina, Old Men of the Fiesta:An Introduction to the Pascola Arts (1980), and I began visiting the Arizona State Museum’s Yaqui and Mayo collections. Through these experiences I discovered the masks of Plácido and Marcelo Alamea. Today I will focus on Plácido. 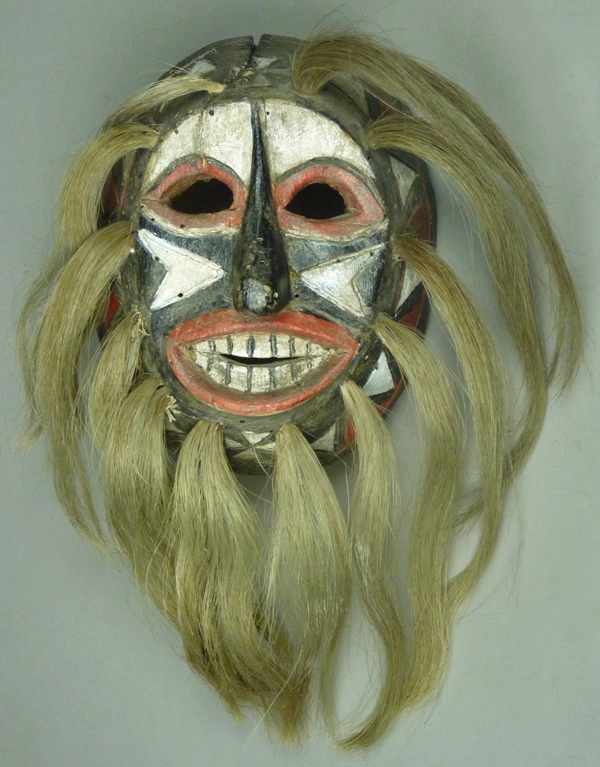 Here is one of the masks carved by Plácido Alamea that was collected by James Griffith during his research in 1965. What a beauty! From the time that I first discovered Plácido’s classic mask style, I wanted one or more for my collection. Ultimately one doesn’t get to collect what they want, but what they encounter. I wasn’t able to buy a mask by Plácido until 10 years later, when Tom Kolaz offered to sell me one. As you will later see, this is a very unusual and interesting mask. Then, in around 2005 I obtained a more classic example, which I will show you first. I bought this mask from the John C. Hill Indian Arts Gallery in Scottsdale Arizona, with no provenance. While this mask exemplifies Plácido’s style, I am uncertain whether it was carved by Plácido or Marcelo. On first glance, you may have noticed that this mask exhibits many generic Rio Mayo Pascola design elements, such as the chevron shaped wedges that flank the nose, a forehead cross composed of four triangles with their points together, a mouth like those on masks by Pancho Parra and Bonifacio Balmea, and hair bundles that frame the face in a circle. These are all typically found on Alamea masks. An unusual detail is the chin cross, which matches the one on the forehead, and appears to be original to the mask. The rims of the eyes were carved in relief, another common feature of masks by the Alameas. This week I am introducing you more fully to another excellent and prolific Rio Mayo maskmaker, Bonifacio Balmea Sauzemea, of Guayparín, municipio of Etchajoa, Sonora, who is sometimes erroneously referred to as Bonifacio Valenzuela. I had inadvertently included one of Bonifacio’s masks from another collection in my post of September 10, 2018, thinking that it was a mask carved by Pancho Parra. Bonifacio’s masks often resemble those of Pancho Parra, so much so that one commonly finds masks in major collections that were made by one of these carvers but misidentified as the work of the other. I will start with a trio of masks by this artist that I purchased from Tom Kolaz in 1998. This one was said to date from the 1960s. It has what I call “almond shaped ” eyes, which are commonly seen on Bonifacio’s masks, but alternating with other eye designs, and all these options are to be found on the masks of other Rio Mayo carvers. The rims of these particular eyes are painted but not elevated (not carved in relief). Bonifacio also chooses from a number of mouth designs. I will call this one a “pointed grin,” when comparing it to his other favorites. Mouths with either flat or curved upper lips and pointed ends are characteristic for this carver, and one could call them auxiliary identifiers, but they too are sufficiently generic that they don’t distinguish one carver from another.